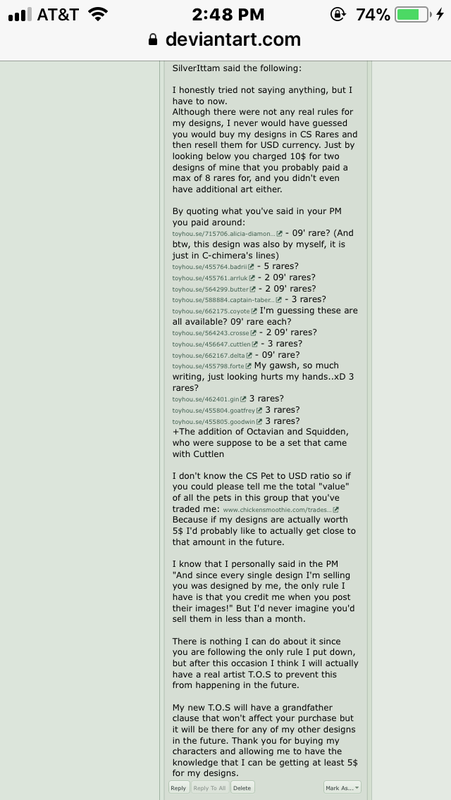 They're pretty highly talked about on Furvilla (pet site) as well for this, and a lot of the users there (including ones they've bought from for site currency) are having massive issues with them because of it. Wow, this person is just greasy. e.e; However, might I add my opinion to this as well? Technically, what is stated in Pvff's "TOS" (aside from her voiding the other person's TOS) is already what legally happens when someone is handed copyright ownership of a design, unless the recipient physically or electronically signed a TOS stating otherwise. So in this sense, their TOS is mostly law-abiding and is legally sound (and common in professional trading / dealing with copyright ownership of something) - however, in order for HER TOS to be legally binding, along with the person she is trading with, they both have to physically or electronically sign that TOS. This can be done through (a) Paypal Invoice (b) Google Forms (c) Any sort of online physical signing, such as clicking an "I agree" box on a site when signing up, etc etc. However, the question I have: Has she signed another person's TOS? Or has that person signed hers? Simply saying "By buying, you are-" is not at all legally binding (on both sides), and upon trading a character, the recipient by law can do anything they want with that character unless a TOS (which has to be signed) has stated otherwise. If not, then this honestly falls down in the bracket of 'good faith' trading and ultimately.. I hate to play the devil's advocate, but she has the right to use the designs (whether it be trading, reselling, etc) in any way, shape, or form if no TOS has been signed - because thats the standard usage that comes along with relinquishing copyright ownership of your adoptable / trade / design / etc. However, if she has electronically signed a TOS and has broke it, then she is ultimately breaking the law and she can be taken to court for a breach of TOS and contract agreement. Anything else she has done (such as flipping characters, falsifying their credit, etc) is wrong though and I agree with the others - I am very glad you wrote this PSA. I just wanted to write my little tid-bit here so other people can know; MAKE PEOPLE SIGN YOUR TOS SO IT'S LEGALLY BINDING.. this will save you sooooooo much trouble in the future. edit: just in case people ask in the future; I know this because I have spoken with an attorney about this, considering I have had issues with breaching TOS many times. In a sense, it kind of cancels each other out. Both of you retain rights to the artwork so both parties can use the artwork fairly unless you make the person sign a TOS upon receiving the fanart - and even then, they can still use the artwork since it features their copyrighted character. You can only really make them sign an agreement that they cannot profit off of your fanart or commissioned artwork - which as you stated, is unlikely to happen in the community because most people don't realize that good faith doesn't get far in court. this is really messed up. I thought her apology seemed hollow but now its pretty much confirmed shes only saying sorry because she got caught. and her going " uwu getting called out for doing bad stuff makes me sad and anxious!!!!!!" like......girl just stop scamming people. Ah, the poster didn't want me to ping them. -Sighs loudly.- Sorry, long day. The first step to becoming a better person is to realize your mistakes and do your best not to relapse into being the problem again, not asking someone to hide your bad deeds like they never happened. I'm sorry that you're hurt over this, I really am; as someone who also suffers from anxiety around people, I also hate confrontation. 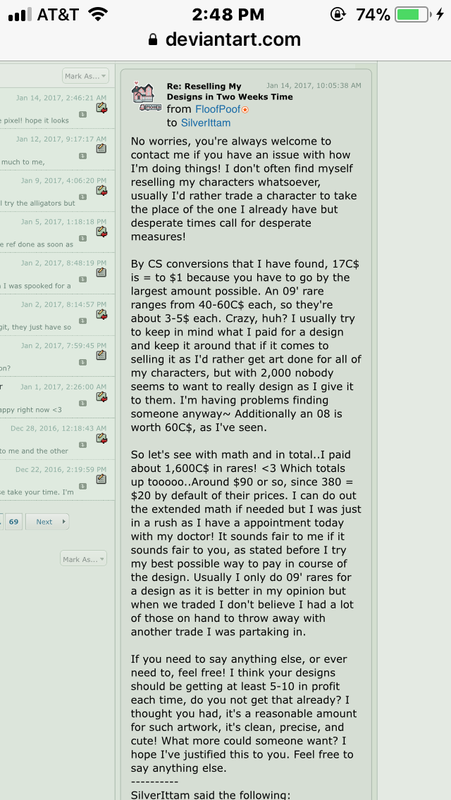 However, this thread provides insight into what not to do in this community. I hope that you'll really consider that the ToS of other artist's are first and foremost, because they're the ones who put their hard work into a design for buyers.